Danubii Fluminus ( a fontibus prope Doneschingam usq Posonium urbem defignati) Pars Superior, in qua Suevia, Bavaria, Asutria, Stiria, Carinthia, Carniola, Tyrolis et Helvetia com magna parte Italiae exhibentur a Ioh. Bapt. Homanno S.C. M. Geographo Norimbergae. A stunning map of the Northern Part of Italy. Switzerland, and parts of Germany. 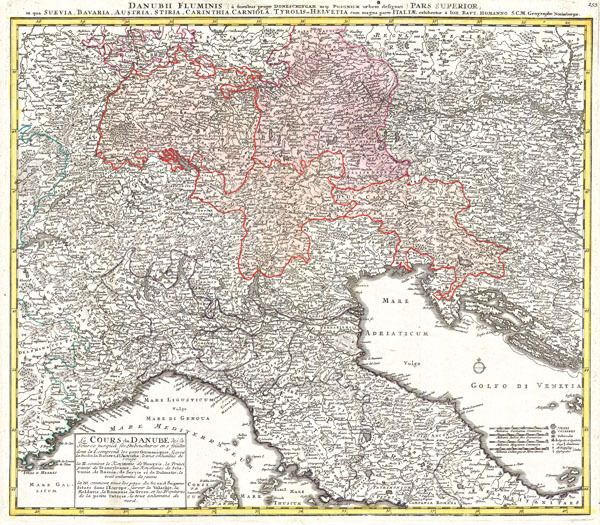 Covers from Rome in the south, north as far as Bavaria and Bohemia, to Provence in the west, and modern day Albania in the east. This highly detailed map was constructed to illustrate the western extant of the Danube River. Printed c. 1720. Fine or perfect condition. Original printer’s platemark visible. Blank on verso. Wide margins.